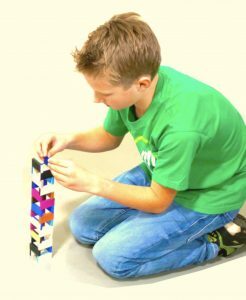 In order to successfully create large scale highly creative domino projects the use of high-quality dominoes is essential. As the world record holder we know this like no other. 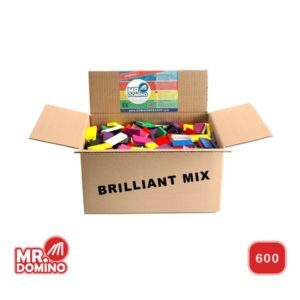 The dominoes we use are the result of our own development throughout the years, in which the dimensions, weight and colour of the dominoes have been optimized. 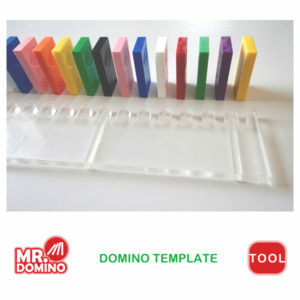 The dominoes of Mr.Domino are produced in the Netherlands, exactly according to these specifications. 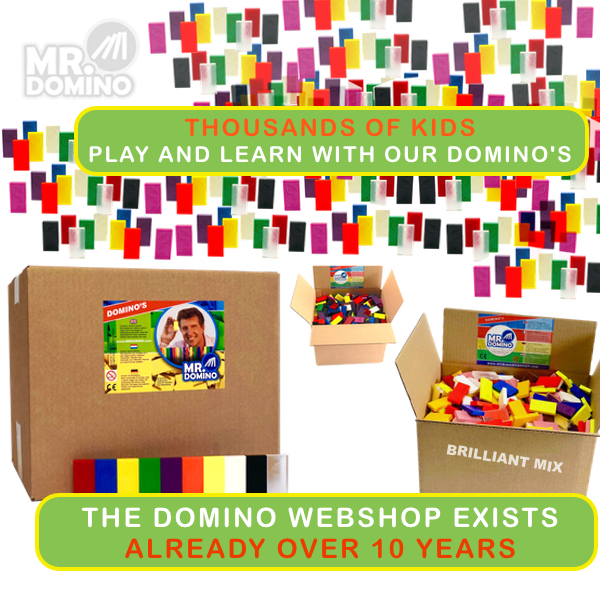 The dominoes made by Mr.Domino are packaged in handy buckets or carton boxes. So you can easily take your dominoes with you and store your dominoes. You can see it … The unique and registered Mr.Domino logo is on the domino. This way you can always see that you have the real domino. The quality you can see by the colour and stability. 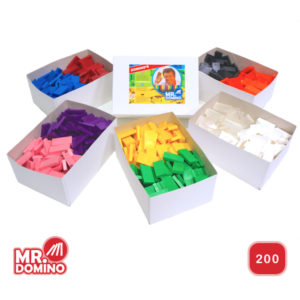 * The dominoes are made of solid polystyrene and therefore relatively heavy (about 8 grams). * The dominoes are straight and the dimensions are exactly 4.8 x 2.4 x 0.7 cm. * The dominoes are finished off perfectly, so the edges are sharp. 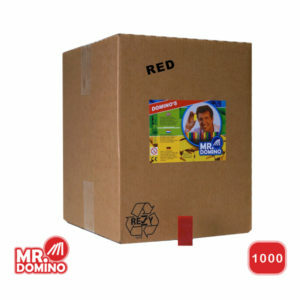 The requirements for the colours of the dominoes are also very high. You can only get beautiful domino images with real colours. Black should be black, not dark gray. And white must be white, not off-white. Mr.Domino’s colours are bright and beautiful. 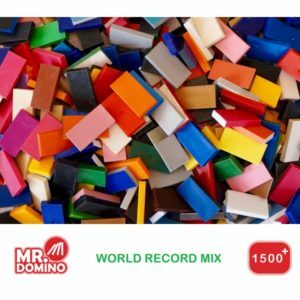 You can feel it … Dominoes made by Mr.Domino are relatively heavy (8 grams) because they are made of solid plastic. This is important for the stability of the domino and you feel it when you are building a domino project. During the manufacturing process, solid plastic products tend to deform. Of course the highest quality standards apply to the production process of Mr.Domino. Therefore our dominoes are completely straight. You can hear it … When building a domino project you always try to imagine how the dominoes are going to fall. 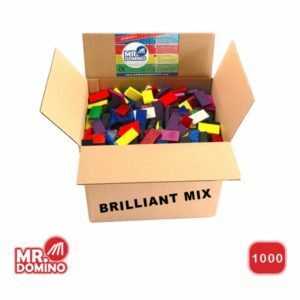 This was an important element as we designed the Mr.Domino dominoes. The dominoes made by Mr.Domino are designed to lie still almost immediately after falling down. You can hear this very clearly because the domino touches the surface once and does not vibrate afterwards. This minimizes the chance of a domino ‘breaking out’ and pushing over a row of dominoes not yet intended to fall. This characteristic is of great importance, especially in projects where the dominoes are close to each other.